Our featured listing at 30 Hopetown Road is located within the popular I’On neighborhood in Mount Pleasant. The planned community was designed in the style of new urbanism, with shops and restaurants at the entrance to the neighborhood along with preserved natural areas, community parks, walking trails and more. The I’On Club also offers additional amenities to members including tennis courts, fitness facilities, a pool and more. 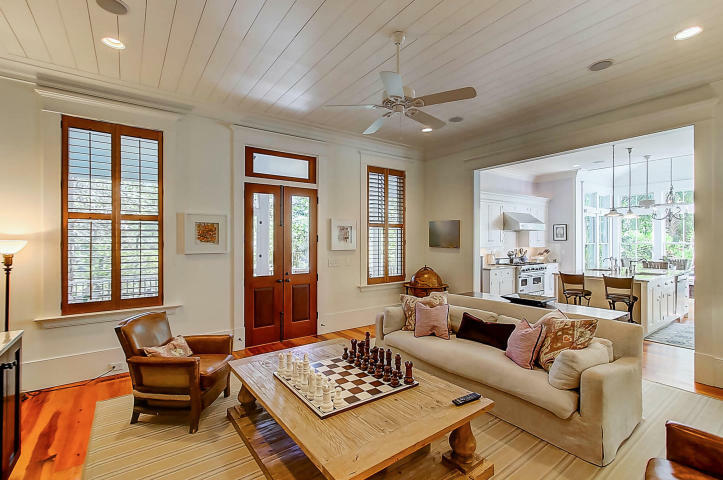 30 Hopetown Road has a classic design that exudes curb appeal. Dark blue shutters accent the white facade, with a brick pathway leading to the large covered front porch. 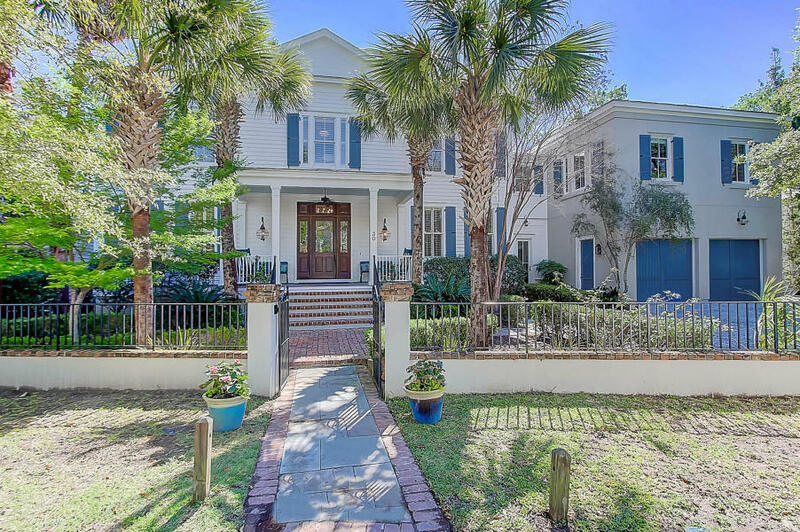 Palmetto trees and lush shrubbery add pops of color and there is a wrought-iron gate defining the entrance to the property. Inside, the spacious home has a light-filled floor plan with nice formal rooms and casual living spaces. A central foyer runs through the home, with a formal living room to the left and a formal dining room to the right. 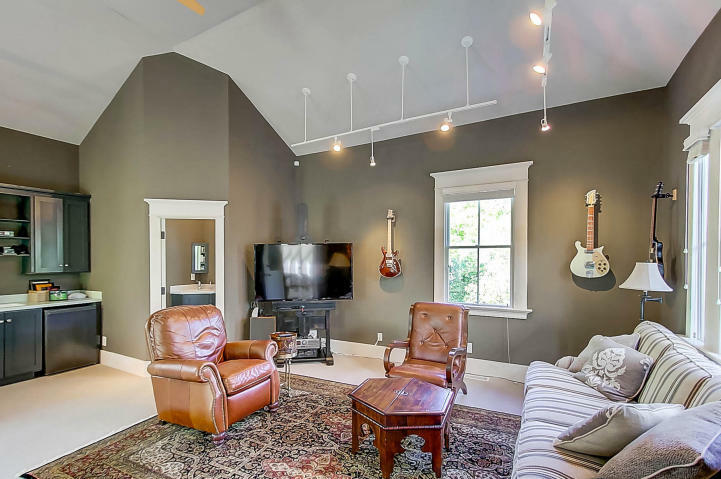 The level of finish is immediately apparent with wide plank heart pine floors, wainscoting, fireplaces, detailed trim, built-in bookshelves and more. In the rear of the home are the main living spaces–which include the family room and kitchen. 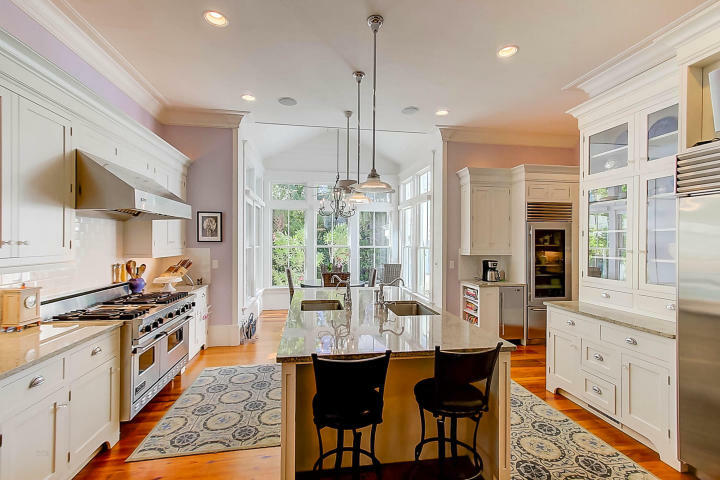 Granite counters, high-end stainless appliances, custom cabinets, a center island, tile backsplash and a sunlit breakfast nook define the kitchen. There is also a well-designed butler’s pantry, with a wine fridge, farmhouse sink, granite counters and floor to ceiling cabinets for ample storage. Just beyond the kitchen is the family room which has wood-beamed ceilings and a built-in media cabinet. 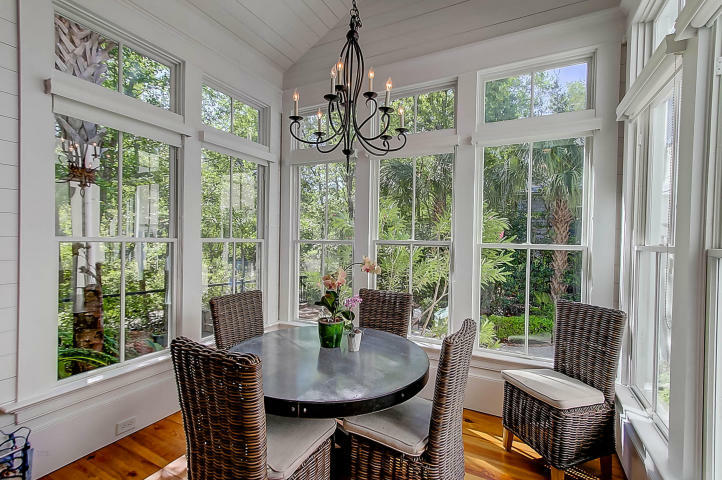 French doors open to the screened porch, creating create flow between indoor and outdoor living. Other highlights of the first floor include a powder room and a mudroom with built-in desk for an office. The home has five bedrooms. 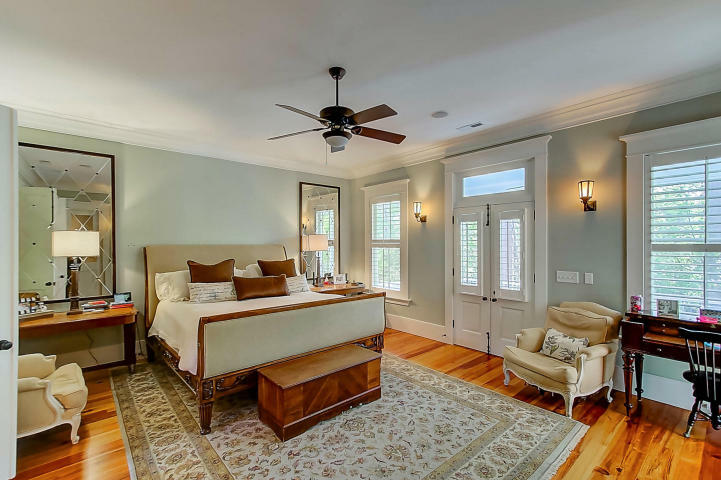 The master suite is located on the second floor and showcases nice finishes such as tall ceilings, a large walk-in closet and access to a private screened porch overlooking the marsh. The en suite bath is also stunning with dual vanities, marble counters, a soaking tub, WC and large tiled shower. A secondary guest suite is also located on the second floor, along with two additional bedrooms that share a Jack and Jill style bath. There remaining guest suite is on the first floor. 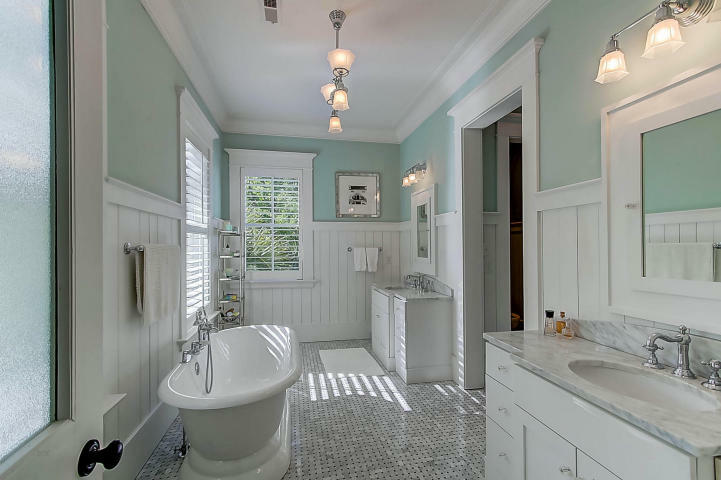 The bedroom is tucked off of the living room, with access to the screened porch along with an en suite bath with shiplap walls, marble-topped vanity and large tiled shower. The laundry room is also located on the second floor for easy access and there is an open living space. The third floor of the home is also finished and is currently being used as a playroom. There is a full bath along with plentiful attic storage and a private porch with views of the river. Another attractive feature is the home’s mother in law suite. Located above the garage, the finished room is incredibly spacious with tall ceilings and new carpeting. There is a wall of built-in cabinets and a full bath with a shower, making it an ideal space for a rental or out of town guests. In addition to the great interior features, there is also much to enjoy outside. The expansive screened porch is one of the most-used living spaces in the home. 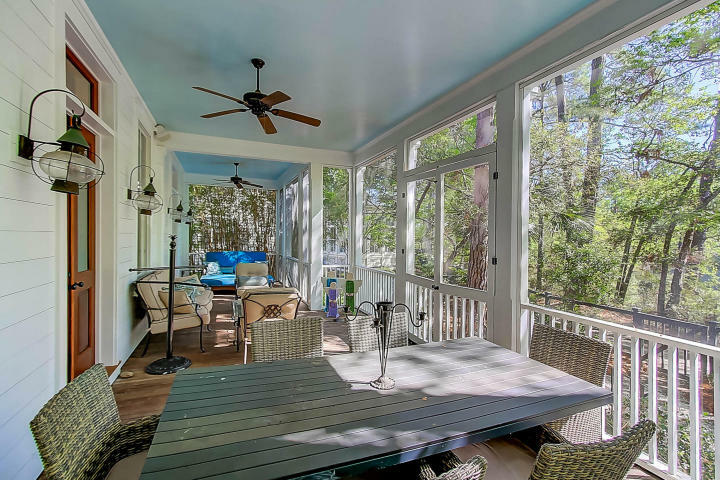 Equipped with ceiling fans and styled with haint blue ceilings, it is the quintessential Lowcountry porch. A walking path and the marsh are on the other side of the fenced yard, so you can enjoy the peace and serenity of your natural surroundings. There is also a screened porch off of the master suite, a porch on the third floor and a stone dining patio. 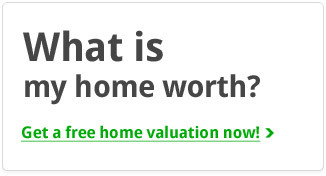 The yard is also completely fenced which is ideal for those with pets! For more information on this home or to setup a private showing, please contact listing agent Jimmy Dye. 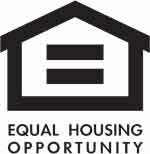 Click here for a photo slide show of the home or click here to see more homes for sale in I’On.